Finance Guru Speaks: I received two SMSes from EPFO Office. One in English and One in Hindi. "Congratulations on getting portability facility for EPF account. Now you can operate your account without any intermediation. Narendra Modi"
"कर्मचारी भविष्य निधि में पोर्टेबिलिटी की सुविधा प्राप्त होने पर बधाई। अब बिना किसी मध्यस्थता के आप अपने खाते का सीधा संचालन कर सकेंगे। नरेंद्र मोदी "
For who don't know, UAN allows portability of your EPF accounts even when you keep changing your jobs. So, it is a kind of single account where you can track your full EPF money (from all your previous employers / EPF Accounts). Provident Fund Portability Scheme has been inaugurated by Prime Minister of India on 16th Oct 2014. Once you have UAN based registration, there would be no need to keep on filling Form 13 for EPF Account transfer from one Employer to another. 1. Open UAN Member Portal. Your UAN is allotted, kindly get your UAN No. from your employer. • Activate your registration to avail various facilities such as UAN card download, member passbook, updation of KYC information etc. • As of now, only active members (contribution received through ECR for the wage month October 2013 onwards) would be able to register themselves. 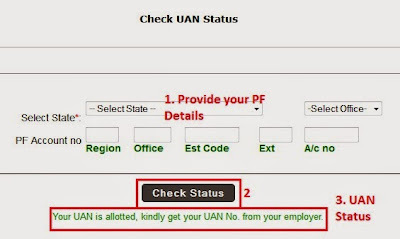 • For registration, obtain UAN from your employer alongwith your member ID. • Your mobile number would be required to activate registration.